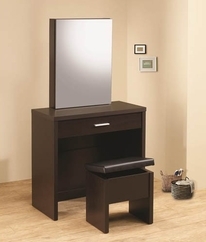 The vanity table or vanity works great as a make-up table. The vanity table or vanity serves many functions. The vanity, mirror, and bench set first became popular in the 18th century. The "make up table" were commonly used by men for grooming. Today these have become most popular furniture among many women and men.